Sensational revelations may put to rest the tragic relationship of 20th century’s enduring literary giants. | Don't mention the M word! Wells festival of Literature audience is set to hear sensational revelations about one of 20th century literature’s enduring tragic relationships. 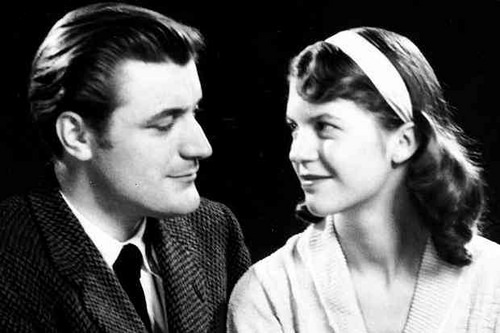 Sylvia Plath and Ted Hughes – two literary giants – were married in 1956 until her suicide in 1963. The unanswered questions surrounding the demise of their emotionally charged relationship, leading to her death, has provided an afterlife in itself and was something Hughes spent half a lifetime trying to bury. Details of the yet unpublished Ted Hughes: The Unauthorised Life, by Prof Jonathan Bate, is grabbing headlines in the media and is already receiving literary attention. It is one of 12 books on the long list for the Samuel Johnson Prize for Non-Fiction, (the winner will be announced on November 2nd). Sir Jonathan Bate, provost of Worcester College, Oxford, was given “full access, unlike earlier biographers” to Hughes’s archives in the US and papers placed more recently in the British Library. Prof Bate will be starting his national promotional tour of his new work at Wells Festival of Literature on October 13th. Bate has been able to untangle a corrosive relationship complicated further by Hughes’ infidelities. Plath and Hughes separated in the autumn of 1962, following his affair with Assia Wevill. While separated he began a relationship with Susan Alliston. Bate’s new biography has discovered a shocking truth that while Sylvia was committing suicide, Hughes was with his lover Susan only a mile away in the home he and Plath spent their wedding night together. Bate’s book will shed further light on Hughes’s relationship with Assia Wevill, which continued after Plath died. Assia killed herself, along with her and Hughes’ 4 year old daughter (Shura), in 1969. Plath fans have been vociferous in their opinions on Hughes’ role in Sylvia’s suicide, fuelled further by how he oversaw the posthumous publication of her writing. In life, in death, Sylvia was a troubling force to Ted Hughes. In his last published poetic work, Birthday Letters (1998), he poignantly touched on their relationship, but didn’t address directly the circumstances surrounding her death. Only when a poem by Hughes – Last Letter – was dramatically discovered in October 2010, does he describe what happened during the three days before she died. Ted Hughes was born in 1930 and died 1998. His ground-breaking first collection, The Hawk in the Rain, was published in 1957. He is considered to be one of the best poets of his generation and was British Poet Laureate from 1984 until his death. Hughes once described the creative process as akin to a kind of hunting. It seems the subject of Plath and Hughes may have finally been hunted down as Hughes put it himself “with patient concentration” by Prof Bate. You can book tickets for Prof Jonathan Bates from the main festival website.